What does it mean to be environmentally conscious in 2019? Is it as simple as recycling, or does it also entail voting with your wallet to support businesses with sustainable practices? As Earth Day approaches, we at Aquasana wanted to gauge what people are doing now to make our planet a more sustainable place and how they’re making eco-conscious decisions to better their health. To learn more, we conducted a 2,000-participant survey to gather insight into how people are thinking about water quality, how they are approaching environmentalism and eco-friendly purchasing, plus what they’re getting right and where they’re facing challenges. We found that the vast majority of respondents (76%, to be exact) consider the environment extremely or very important. Even so, with a constant deluge of new information about the impact of our disposal and purchasing habits, it’s difficult to get it all right. The sum of those efforts, however, even when imperfect, do add up. Understanding these misgivings enables us, as a company and as residents of the Earth, to better reach those striving for sustainability in their day-to-day lives. In this post, we take a detailed look at the behavior of specific groups of people, including those who prioritize water conservation and quality, individuals who aspire to eco-consciousness, green shoppers, women vs. men, and parents vs. non-parents. Water Worriers are individuals who care about water quality and aspire to prioritize water conservation. In our survey, they reported that they find it very important to filter their tap water and are knowledgeable about harmful water contaminants like PFOA/PFOS. Those who make up this group of people are more likely to be millennial men who are married, live in an urban area, and own a pet. While Water Worriers are 57% more likely to practice water conservation than non-Water Worriers (74% vs. 47%) by doing things like using a low-pressure shower head and restrict watering their lawns, their eco-conscious behaviors don’t always lend themselves to other areas of sustainability. For instance, Water Worriers are 33% more likely to say the environment is extremely important to them (44% vs. 33%) but less likely to actually recycle (64% vs. 83%) and less likely to use reusable grocery bags (51% vs. 69%). As far as purchasing habits go, Water Worriers are willing to spend more to meet their water quality and conservation aspirations. Compared to other survey respondents, they’re 14% more likely to say they would pay more to guarantee clean and safe water, and are willing to pay far more per month to make that happen (31% of Water Worriers are willing to pay 20% or more per month, vs. 12% of non-Water Worriers). Their purchasing habits extend beyond just that of clean, uncontaminated water. Not only are they 425% more likely to say they always seek out products that are good for the environment (21% vs. 4%), they also are 38% more likely to say they’ve stopped purchasing items because of their impact on the environment (33% vs. 24%). This means they’re more likely to shell out money at a greater rate for products like reusable straws (35% vs. 22%), rechargeable batteries (45% vs. 38%), and reusable food wrap (19% vs. 8%). Many of our survey respondents (76%) aspire to be environmentally conscious, saying that the environment is extremely important. We found that these individuals are more likely to be baby boomer women who are married, from a Western region of the U.S., live in an urban area, and have a lower income. While a majority of eco-conscious respondents (89%) say they’re driven by a desire to positively impact the planet, millennials appear to be motivated by other sources. Millennials are 122% more likely to be motivated by political reasons (20% vs. 9%) and are 86% more likely to be motivated by societal pressure (13% vs. 7%). We found that those who aspire to eco-consciousness have some gaps in knowledge regarding which items are recyclable, and more so than their non-eco-conscious counterparts. 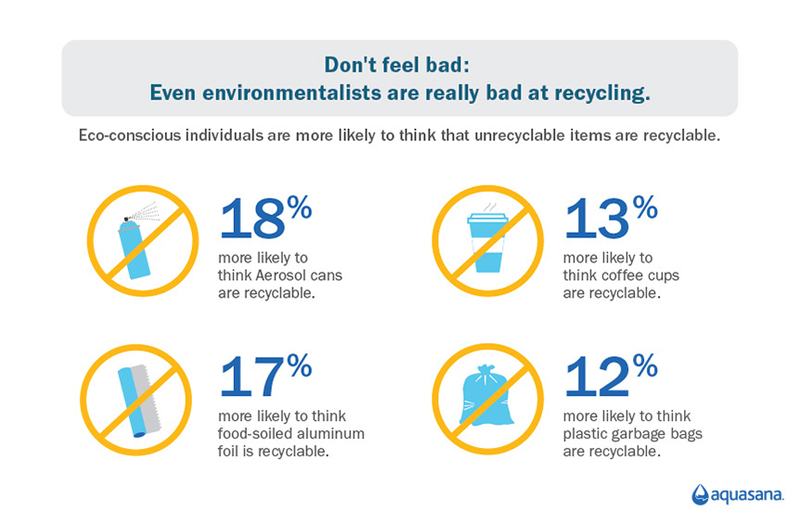 For instance, they’re 17% more likely to think food-soiled aluminum foil is recyclable, as well as coffee cups (13% more likely), plastic garbage bags (12% more likely), and Aerosol cans (18% more likely). *None of these items are recyclable. Though their recycling habits are more aspirational than correct, these individuals do make an effort to display eco-consciousness by purchasing green products. The most popular green products among this group include organic food (66%) and eco-friendly cleaning supplies (54%). Additionally, millennials are 26% more likely to choose cosmetics because they are green and/or toxin-free. (29% vs. 23%) as well as haircare (also 29% vs. 23%). Eco Shoppers, those who say they always purchase products from companies that are environmentally conscious or always seek products that are sustainable for the environment, take water quality seriously. They’re 40% more likely to be familiar with PFOA/PFOS in water, and they’re willing to pay to ensure they’re drinking clean, high-quality water. 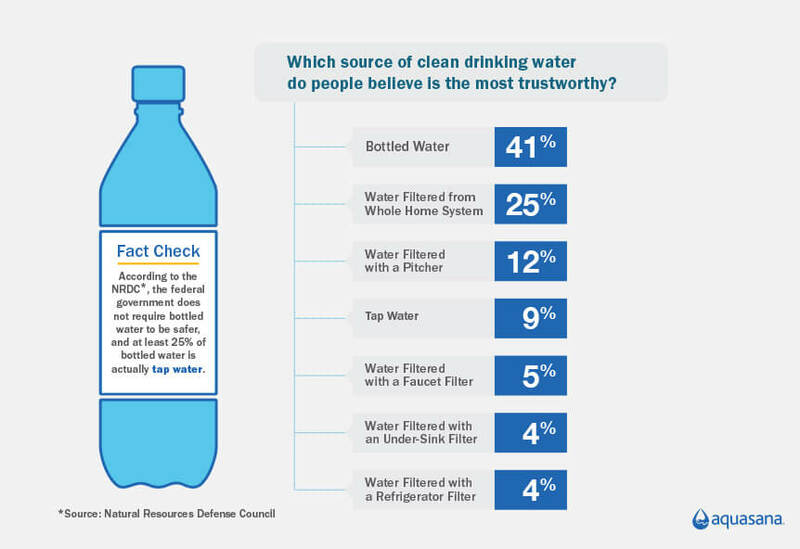 In the survey, they reported being 86% more likely to pay significantly more (30%+ more per month than non-Eco Shoppers) to guarantee that their water is clean (13% vs. 7%). Many Eco Shoppers work to ensure water quality by leveraging filtration. They’re 57% more likely to use a faucet filter, 24% more likely to use a filtration pitcher, and 33% more likely to use a free-standing water cooler. Non-Eco Shoppers, on the other hand, are 21% more likely to not filter their home drinking water. Eco Shoppers’ purchasing habits also extend to water quality-related items. In the past year, Eco Shoppers are 70% more likely to have purchased a whole house filter, 67% more likely to have purchased an under sink filter, and 100% more likely to have purchased a shower filter. Non-Eco Shoppers are 38% more likely to have not purchased any water filtration products in the past year. We found that women and men have slightly different approaches to sustainability. Whereas women who say the environment is important to them are motivated by personal morals (68% of women vs. 63% of men), men are more likely to find their motivation in political reasons (18% of men vs. 14% of women). Overall, women are more likely to say they recycle (81% of women vs. 76% of men) and are more likely to know what items are recyclable vs. which ones aren’t. Men, however, are 40% more likely to drive electric cars (7% of men vs. 5% of women) and are also more likely to say they’ve taken advantage of a city/state incentive for the environment (50% of men vs. 42% of women). Parents, as a whole, appear to make more efforts towards environmentalism. They’re 15% more likely to practice some form of water conservation (78% vs. 68%), especially when it comes to collecting rainwater (26% of parents do this vs. 13% of non-parents) and restricting lawn watering (40% vs. 33%). They’re also 11% more likely to say they would pay more to guarantee their water is clean and safe from contaminants (92% vs. 83%), with 20% of parents willing to pay 20% or more per month, vs. 13% of non-parents. Given these statistics, it’s unsurprising that parents are 150% more likely to be a Water Warrior (30% vs. 12%). They’re educated in water quality (they’re 90% more familiar with PFOA/PFOS) and make decisions based on that knowledge. Parents are 38% more likely to say it’s necessary to filter tap water (66% vs. 48%). This knowledge and eco-conscious effort also impact parents’ shopping habits. Parents are 67% more likely to say they always seek sustainable products (10% vs. 6%); they are also likely to purchase reusable coffee cups, straws, food wrap, produce bags, and rechargeable batteries. The reason behind this is three-fold. In our survey, parents who say the environment is important to them reported that they’re more likely to be motivated to be environmentally conscious by political reasons (20% vs. 14%), pressure from society (13% vs. 9%), and pressure from friends and family (7% vs. 4%). Aquasana has always been dedicated to improving the overall health of every home by delivering clean, healthy water through best-in-class water filtration. We understand that in 2019, the relationship between what we put in our bodies and what we put into our environment through our actions is stronger than ever. However, obsessing over every eco purchase is both unrealistic and untenable for most American consumers. Our survey shows that while attitudes towards environmentalism and water quality are evolving, there is no one way to be eco-conscious. Consumers, while using their wallets to push companies towards more environmentally-friendly business practices, still forgive themselves when it comes to making everyday eco-conscious decisions. Aquasana wants to make one of these decisions just a bit easier for consumers by offering multiple options for clean water without the disposable plastic bottle. Aquasana also leads the way in informing consumers of the dangers of harmful contaminants like PFOA/PFOS, both for the environment as well as the impact on your personal health. Based on what we’ve learned, consumers appear to make sustainable choices when they’re empowered to—when they’re informed and eco-friendly products are accessible. U.S. consumers want to protect the environment. Aquasana hopes to work with our customers to make our planet a more sustainable place.